Celebrate Canada Day at the annual Kanata Summer Festival with neighbours, family, and friends. Finish your Canada Day with fireworks at George Richardson Park (off Bayview Parkway). There is a pancake breakfast from 8 a.m. to noon at the Community Centre and Lion's Hall (200 Doug Duncan Drive). Location and time: Newmarket Riverwalk Commons (200 Doug Duncan Drive) from 11 a.m. to 4 p.m., fireworks at George Richardson Park from 7:30 to 10:30 p.m.
Join us at the Elman W. Campbell Museum for our Canada Day Open House. Special displays, demonstrations and lots to do in the downtown core. Admission is free. Location and time: Elman W. Campbell Museum (134 Main Street South) from 10 a.m. to 4 p.m. Looking for something fun to do this summer? Join us on Tuesdays from 7 to 8 p.m. for Kids Downtown. This child-oriented entertainment show allows you to bring a lawn chair or a blanket to enjoy the evening’s entertainment. Check newmarket.ca/events closer to the date for more details. Sponsored by TD Canada Trust. In the case of inclement weather conditions, the show will be moved inside the Newmarket Community Centre and Lions Hall. Location and time: Newmarket Riverwalk Commons (200 Doug Duncan Drive), from 7 to 8 p.m.
Come out to Newmarket Riverwalk Commons (200 Doug Duncan Drive) every Sunday starting in July for Music in the Park, from 7 to 8:30 p.m. This event will feature free musical performances from local entertainers showcasing their talents. In the case of inclement weather, the event will be cancelled. Location and time: Newmarket Riverwalk Commons (200 Doug Duncan Drive) from 7 to 8:30 p.m. 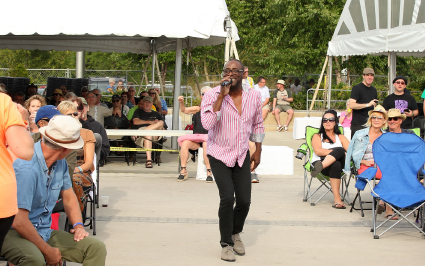 The TD Newmarket Music Festival Summer Series starts with the Music at Riverwalk Series (MARS) every Thursday from 7 to 9 p.m. MARS will present top tribute bands like the Beatles, Shania Twain, The Stones, Garth Brooks and more. There will also be a meet and greet with the stars after their performances from 9 to 9:30 p.m. at local restaurants. It’ll make for the perfect photo op! Location and time: Newmarket Riverwalk Commons (200 Doug Duncan Drive) from 7 to 9 p.m.
After the success of last year’s inaugural festival, the Newmarket National Ten Minute Play Festival is back, celebrating our country’s diverse voices and regional perspectives. The Town of Newmarket offers artists from across this great country; a national “new market” for their stories, and a national stage for their regional perspectives. This year’s festival runs for five days, from July 25 to 29 and will feature some new surprises! The Town of Newmarket invites you to our summer family camp out on Saturday, July 21 at Environmental Park (Woodspring Avenue) and on Saturday, August 11 at Fairy Lake Park (Water Street). Whether you are an experienced camper or this is your first time, come spend the night. Pop your tent, eat a traditional camping dinner, have fun, play games, sit around the campfire eating s'mores and sleep under the stars. Cost is $15 per person. Finish your camping experience by waking up with the sunrise and enjoy breakfast around the campfire. In partnership with Lake Simcoe Region Conservation Authority. 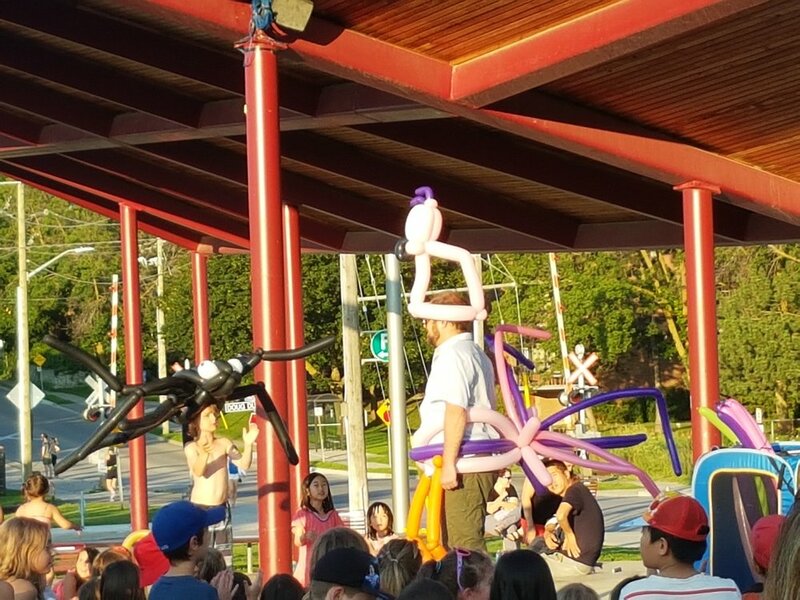 Location and time: Environmental Park (Woodspring Avenue) and Fairy Lake Park (Water Street), beginning at 1 p.m.
Come and be amazed by incredibly talented and unique street performers who will provide a full day of entertainment for the whole family! Location and time: Newmarket Riverwalk Commons (200 Doug Duncan Drive) from 3 to 10 p.m.
Moonlight Movies are back for another season. Enjoy a free outdoor movie on a large inflatable screen under the stars. Don’t forget to bring a lawn chair or blanket and snack to enjoy. Free popcorn will be provided by the Newmarket Scouts. Movies will be announced closer to the date. The movies begin at dusk (approximately 8:15/8:30 p.m.). Sponsored by TD Canada Trust. Bring your friends and family to Newmarket’s Riverwalk Commons (200 Doug Duncan Drive) and join us for the annual Garlic is Great Festival! Take part in the annual celebration of Ontario’s garlic harvest. At the festival, visitors can enjoy cooking demonstrations, musical entertainment and garlic vendors at the Newmarket Farmers’ Market. Location and time: Newmarket Riverwalk Commons (200 Doug Duncan Drive) from 8 a.m. to 1 p.m.